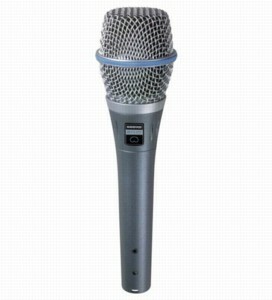 The Beta 87C premium vocal microphone delivers studio-grade performance and a smooth, extended high-end frequency response in a cardioid condenser design. The microphone adds warmth to the frequency response and creates an ideal environment for in ear personal monitoring. And its highly consistent cardioid pattern offers excellent rear rejection. The Beta 87C offers an extremely smooth, tailored response for a warm, natural sound. The cardioid polar pattern compensates for the isolation often associated with the use of personal monitors. Cardiod, Condenser. Signal-to-Noise Ratio 72 dB at 94 dB SPL (IEC 651)* *S/N ratio is difference between 94 dB SPL and equivalent SPL of self-noise A-weighted. Polarity Positive pressure on diaphragm produces positive voltage on pin 2 relative to pin 3 of the output connector.